My name is Mary Grace. I live in Denham Springs, Louisiana, USA with my adoptive parents. I was born with a handicap. My right arm is a “stump” and my right leg is small and 8 inches shorter than the left, with only three toes. I had a very difficult time growing up because of how I look. When I was just a child, I used to look at the mirror and wondered why I didn’t have a right hand like everyone else. I used to ask myself what did I do to deserve being born like this. I didn’t have any friends, even in school. I was never invited to parties, and shunned by people. Some of my family members were so embarrassed to be seen with me. I was practically hidden as a child. When guests came to our home to visit, I was told to stay in my room, or I had to cover my stump. As a child, I couldn’t do any menial jobs like buttoning my dress or taking off a candy wrapper. I felt so sorry for myself, especially when kids made fun of me. Their taunting hurt. 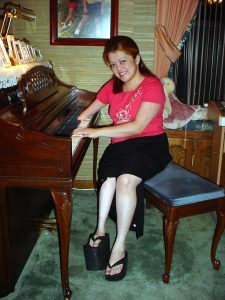 Handicap piano musician I wear a platform orthopedic shoe on my right foot so I could walk and not limp. I wear pants or long skirt to hide my short, ugly leg. For a long time, I didn’t have any self-confidence, my self-esteem was very low. I used to (and sometimes still do) cry myself to sleep. If not for God sustaining me, I would have never made it this far. Psychology. I took Psychology to understand why people stare at me. Today I can almost do anything like a normal person with two hands. I no longer feel sorry for myself, for I believe that God does not create “JUNK”. 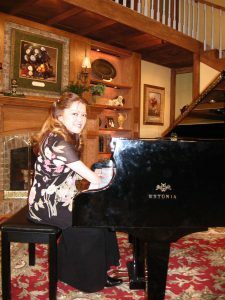 I was five years old when my Grandma saw my interest and found a piano teacher for me. 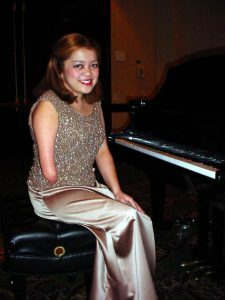 The first three piano teachers whom she approached didn’t want to teach a one-handed student. But my Grandma told them to teach me in one hand and she’ll pay for two, and the fourth teacher took me. 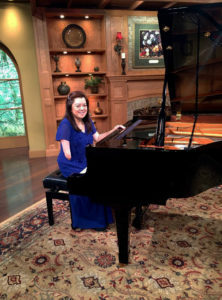 After I started my piano lessons, I found out that I could play with my stump. 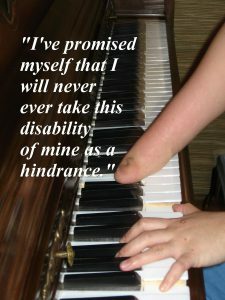 Playing the piano became the outlet to all my sadness. Sometimes my back and my stump hurt when I play but I like to inspire people through my music, and it has become my passion. People who are told to stay away (like me when I was a child). People who are ignored. Due to neglect, they go into pits of despair and utter depression. They become sick and wish that life’s over for them. to others and to give honor to God for creating me this way. For the past 10 years I have been giving concerts for charities without any financial gain for me. I thank God for giving me this opportunity to share His gift for me with you all.